Thousands of uniformed police officers from around the country lined the streets in New York City to pay last respects to slain NYPD officer Wen Jian Liu. NEW YORK -- Funeral services were held Sunday for NYPD Detective Wen Jian Liu, one of two officers ambushed in their patrol car on a street in Brooklyn two weeks ago. Liu was remembered as an incarnation of the American dream: a man who had emigrated from China at age 12 and devoted himself to helping others in his adopted country. Many police officers turned their backs outside the funeral home in Dyker Heights as they watched Mayor Bill de Blasio eulogize Liu, repeating a stinging display of scorn for the mayor despite entreaties from the police commissioner not to do so. Some police officers turn their backs as Mayor Bill de Blasio speaks during the funeral of NYPD Officer Wenjian Liu, Jan. 4, 2015, in the Brooklyn borough of New York. The gesture among officers watching the mayor's speech on a screen added to tensions between the mayor and rank-and-file police even as he sought to quiet them. "As we start a new year, a year we're entering with hearts that are doubly heavy" from the loss of Officer Liu and his partner, Officer Rafael Ramos, de Blasio said. "Let us move forward by strengthening the bonds that unite us and let us work together to attain peace." Liu, 32, had served as a policeman for seven years and was married just two months when he was killed with Ramos on Dec. 20. Liu had long wanted to be a police officer, a desire that deepened after the Sept. 11 terror attacks, his father, Wei Tang Liu, said through tears. And as he finished his patrol every day, the only child would call his father to say: "I'm coming home today. You can stop worrying now," the father recalled during a service that blended police tradition with references to Buddha's teachings. An estimated 28,000 police officers from around the country were on hand to pay a final salute to Liu. Buddhist monks led a Chinese ceremony to begin the services. Video screens were set up so the overflow crowd of officers could watch from outside. A wake and funeral were held for NYPD Detective Wen Jian Liu, one of two NYPD officers ambushed and killed in December in Brooklyn. On Saturday, in the constant, cold rain, police continued to pay their respects to the family of the fallen officer at the wake. 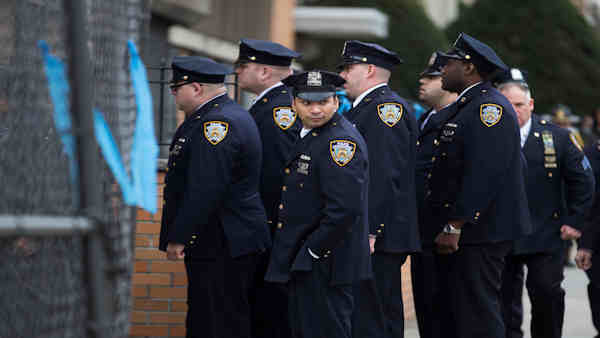 A long line of blue marched into Ralph Aievoli & Sons Funeral Home in Dyker Heights where a broken family sat weeping. A newlywed wife, now a widow and parents now childless, received a host of VIPs - from de Blasio to Police Commissioner Bratton to Congressman Peter King. Governor Andrew Cuomo, brokenhearted himself over the loss of his father, took time to mourn for the slain offcer. "We have to stop any fights within the family and come together as a family of New Yorkers and stand strong - that's a message for all New Yorkers," said Gov. Cuomo. Uniformed police officers from across the country were also among those lining up early for the wake. Among those attending were about 20 officers from the Los Angeles Police Department. Los Angeles Officer Hannu Tarjamo called the killings an "act of savagery that should be condemned by society." "We're not here for politics. We're here solely for the Liu family and NYPD brothers and sisters," said Officer Tarjamo. Luda Kaplan, 67, of Brooklyn, carried a handmade sign with a heart and "NYPD" on it as she stood across the street from the funeral home. She said her son-in-law was an NYPD officer for 20 years. "When he left every morning at 4:30 a.m., we didn't know if he would come home," she said. Before the wake began, some officers sought refuge from a light snow and low temperatures in a church across the street from the funeral home. Officer Liu's wish to become an officer was realized in December 2007 when he graduated from the Police Academy after years of serving the community as an auxiliary cop for the 72nd Precinct in Brooklyn. On Saturday, in Chinatown, the community honored both fallen officers. Thousands attended the funeral last Saturday for Officer Rafael Ramos. The funeral arrangements for Liu took some time, as he had relatives traveling from China. For full coverage on the fatal shootings of two police officers, click here.